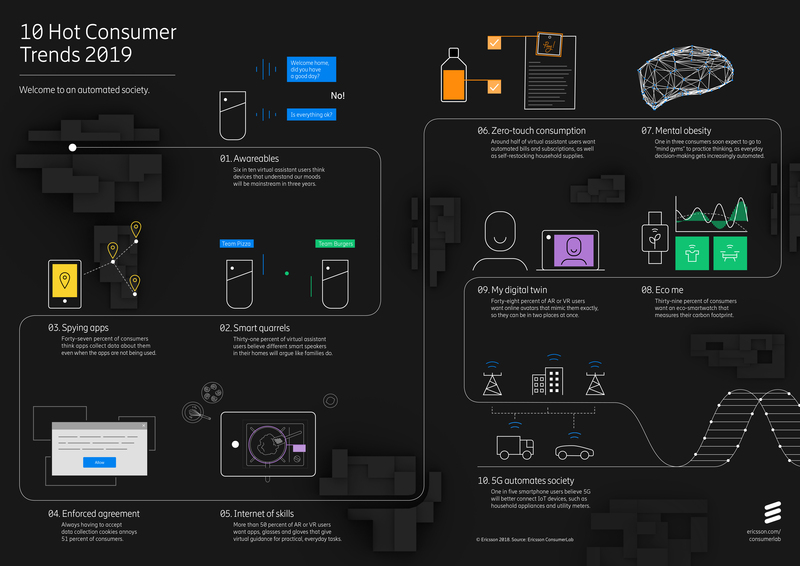 Ericsson on Wednesday released the eighth edition of its ConsumerLab trend report, highlighting 10 hot consumer trends for 2019, representing predictions of 34 million early technology adopters. Dr Michael Bjorn, Head of Research Agenda at Ericsson Consumer & Industry Lab highlighted this in a report made available to newsmen. The report revealed autonomous and mood-predictive technology that could soon play a bigger role in people’s everyday lives. He said that today, artificial intelligence could understand our personality just by looking into our eyes. According to Bjorn, it is clear that technology adopters see a future where our devices know us better than we know them. “Imagine a smartphone that not only knows what you do but also knows who you are,” he said. According to Bjorn, the first trend is awareables, which explains that more than 60 per cent of virtual assistant users think devices that understand our moods will be mainstream in three years. The official said that the second trend had to do with smart quarrels, which said that over 65 percent of virtual assistant users thought smart speakers would argue like family members in three years. “The Spying application which is the third trend projects that over 45 per cent of consumers think apps collect data about them even when they don’t use the app. “The fourth trend which has to do with enforced agreement says that always having to accept data collection cookies annoys 51 per cent of consumers, ‘’ Bjorn said. According to him, the fifth trend which is Internet of skills explains that more than 50 per cent of Augmented Reality (AR) or Virtual Reality (VR) users want apps, glasses and gloves that give virtual guidance for practical, everyday tasks. “The sixth trend which has to do with ‘Zero-touch Consumption’ explains that half of virtual assistant users want automated bills and subscriptions, as well as self-restocking household supplies. “The seventh survey on mental obesity says that 31 per cent of consumers soon expect to go to ‘mind gyms’ to practice thinking, as everyday decision-making becomes increasingly automated. “The eighth survey which is ‘Eco me’ reports that 39 per cent of consumers want an eco-watch that measures their carbon footprint. “The ninth trend talks on ‘My digital twin’ which explains that 48 per cent of AR or VR users want online avatars that mimic them exactly, so they can be in two places at once. “The last trend which has to do with ‘5G automates society ‘ says that about 20 per cent of smartphone users believe 5G will better connect Internet of Things (IoT) devices, such as household appliances and utility meters, ‘’ Bjorn said. Dr Pernilla Jonsson, Head of Consumer and Industry Lab, Ericsson said that we had already entered the age when humans and intelligent machines were interacting and working together. “So far, we have only taken small steps into the future. Most of the zero-touch future is yet to be developed and how we create that future is still in our hands.’’ Jonsson said in a statement. Insights in the report were based on Ericsson ConsumerLab’s global research activities of over more than 23 years,. It is primarily drawn on data from an online survey conducted during October 2018 of advanced internet users in 10 influential cities across the world.